You know that Americans drive on the right. You’ve exchanged your pounds for dollars. But are you familiar with US driving laws? Do you know how fuel stations differ across the pond? Most importantly, have you thought about where you’ll get a decent cup of tea in the United States? When preparing to take a US road trip like Route 66, driving on the other side of the highway is not the only difference between American and British culture that UK roadies need to remember. So here’s my, light-hearted, Route 66 survival guide for British travellers. Enjoy! The average British person drinks two and a half cups of tea a day (YouGov). Except whilst travelling on Route 66 it seems. In fact, it wasn’t until we arrived at Tucumcari, New Mexico, more than 1,000 miles into our road trip, that I managed to sup a decent brew, courtesy of the fabulous Nancy at the Blue Swallow Motel. Even that was a controversial beverage, as you’ll discover in my book Brits on Route 66. On the whole, Americans just don’t share the British love affair with tea. Although the English Breakfast variety is certainly consumed in the US, coffee is far more popular; 280.5 million cups of coffee are drunk every day in the USA. Thus in most of the restaurants and diners we visited during our Route 66 road trip, the closest thing we could find to a cup of Rosy Lee was in soft drink form, either ‘sweet’ or ‘iced’. I wasn’t a fan of either. So if you can’t do without a regular cuppa, you might consider packing some tea bags in your suitcase. However, if you like all-you-can-drink coffee, you certainly won’t go thirsty whilst visiting America. In the UK, biscuits are dunked in tea. In the US, they are usually slavered in gravy. Let me explain. Americans dunk ‘cookies’ (what Brits would call a biscuit) in milk and hot drinks. They use the term ‘biscuit’ to refer to a type of flour-based, flaky scone that is eaten sweet with jam, honey or butter, or savoury with gravy. Think of a fluffy dumpling and you’re on the right track. As if that wasn’t enough to make your brain spin, the gravy is white not brown, like in the UK. It’s made with flour, milk and usually cooked pork sausage drippings. Biscuits and gravy is a Southern American dish, and you’ll find it on breakfast menus throughout Texas and Oklahoma. Be prepared! When driving 2,448 miles across America, there’s a high chance you’ll encounter a fair few red lights at road junctions. That means there’s also a high chance of angering fellow drivers if you don’t understand the American rules of the road when it comes to traffic lights. In the USA, and all eight Route 66 states, it’s legal to turn right at a red traffic light, as long as there is not a sign stating otherwise. You must come to a complete stop before turning right on red, obviously yield to pedestrians and traffic, and only turn if it is safe to do so. However, if the light is marked with a red arrow, you should stop and wait until the green arrow appears before you turn. If you don’t turn right on red when it is legal and safe to do so in America, you’ll most likely hear the honk of a car horn behind you until you pull off. We encountered this quite a few times in Illinois before we learnt the error of our ways! If you’re commencing or ending your journey in New York City (not on Route 66, but a popular road trip starting point), turning right on red is not allowed here, unless there is a sign telling you otherwise. Of course, the above isn’t meant to be legal advice, so do your own research before you travel. In the United Kingdom, a tip is given on an optional basis to a server as a way of saying thank you after a good meal with excellent service. In the United States, a tip of at least 15 per cent is expected after every restaurant meal (other than maybe fast food). If you don’t tip in the USA, you’re considered rude and will be depriving waiting staff of vital income; restaurant servers in America gain a significant proportion of their wage from customer tips. You might also be expected to tip bell boys, parking valets and housekeeping staff. Unlike in the UK, in the USA you must pay for your fuel before you fill up your vehicle. You should park your car at the pump, go inside and pay the cashier for the amount of fuel you think you’ll need (this gets easier to judge once you’ve done it a few times) and then begin fuelling. The pump should cut off once you’ve filled up with the amount you’ve paid for, but if not you will need to go back inside and cover the difference. If you need to fill up your car, look for a ‘gas’ station. You won’t find a ‘petrol station’ like you do at home. This because Americans call fuel ‘gas’. Although the cars are bigger, the fuel prices are often a lot less than what we pay in the UK, so the money in your wallet can literally go a long way. If you ask a restaurant waiter what soft drinks are available, they are likely to say either Coke or Pepsi ‘products’. This confused me at first. What ‘products’ do Coke and Pepsi make other than cola? If you want clear, fizzy lemonade, you should ask for Sprite. If you want cloudy, still (non-carbonated) lemonade, ask for Minute Maid. There’s no denying it, you’ll eat a lot of food in America. The meal portions are enormous – my husband was given a burger as big as his face. It wasn’t even part of a food eating competition. It came straight of the main meal menu. Despite the large plate sizes, we still found ourselves eating three square meals a day. I don’t know if this was because we wanted a break from the road, because we didn’t eat everything on our plate each time, we’re just a bit greedy, or because there was a lot of salt and sugar in what we were eating. So prepare yourself! Have you got any other advice for folks from the UK looking to drive Route 66? Have you experienced any other differences between American and British culture? 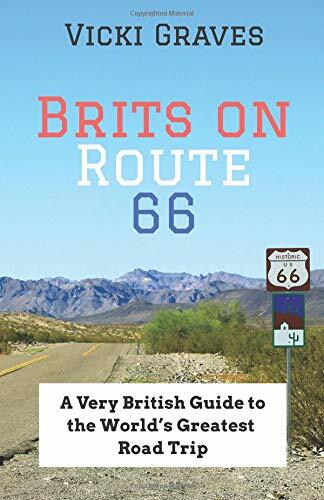 Let me know in the comments and I’ll see if I can add your points to my Route 66 survival guide for British travellers.